It’s been a long winter and we’ve still got a ways to go. Already a heaping helping of all that the season has to offer with piles of snow, record low temps, ice storms and several cancelled school days. I’ve certainly had enough and eagerly await spring. Today’s picture epitomizes that season. A little green starting to line the forest trail for hikers clad in comfy sweatshirts and old pairs of tennis shoes. And yes, one of these hikers is actually wearing two different shoes courtesy of a creek crossing that was only 50% successful. Fortunately, her sister was willing to part with a dry shoe in exchange for one that wasn’t. In this shot, Carly and I are bringing up the rear of a family hike through a postage stamp sort of park mere minutes’ drive from home. 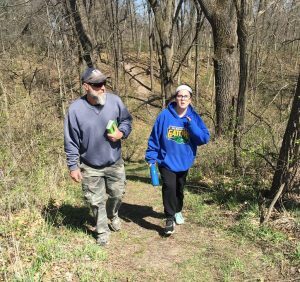 The spot is called Phipps Prairie Park and it’s tucked into a corner between the hustle and bustle of Avenue of The Cities and Illinois Route 5 (before it turns into John Deere Road). A cool little parcel of green space featuring a picnic shelter, playground and hiking trails. An ideal spot to pack along your family, a picnic basket and your field guides for a bite to eat, a little exercise and some outdoor education. In regards to the latter of those items, I need to break out some more of the field guides in 2019 for a Jackson family version of a Bio Blitz. Most of them have been tucked away for too long in a box in the basement, certainly the last place a field guide should reside. Really kind of shameful for a guy with a biology degree. So here’s to some more family time outdoors in 2019 with field guides in hand. Time to get back to the days when a likely answer to the question “What is your favorite book?” would be the Peterson Field Guide to Wildflowers.